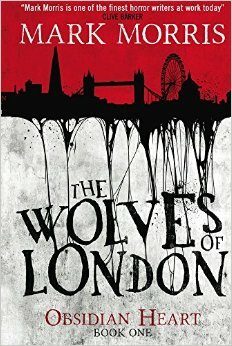 I’m a great fan of urban fantasy that takes advantage of London’s layered past and present. I’m a Londoner, born and bred, and one of my joys is hunting down folktales and legends associated with this amazing city. Stories that go play in that landscape tick an awful lot of intellectual and emotional boxes for me. That’s what brought me to The Wolves of London, and it’s not led me far wrong. The concept seemed fairly simple – an ex-con lured back into a life of crime coming into possession of something magical that nightmarish figures fight to steal away – but the execution is anything but that. This is better described as a crime-horror thriller than an urban fantasy. There’s a definite sense of two worlds side by side and the horrors seem to eclipse the world of gangsters in a rising tide as the story progresses; but it’s flawed. The book is noted as being book one of the Obsidian Heart trilogy, and it definitely suffers from it. It becomes clear that this is the type of trilogy where the story is told across the three books, rather than the three books necessarily being Acts that stand on their own. About two thirds into this book I began to wonder how the waving threads were going to end up being resolved, and then things started expanding and the titular macguffin began to be a bit of a Deus Ex Machina. It makes for some unsettling and spectacular set pieces, but I found myself less and less gripped by the story. It’s frustrating. There’s a lot of very vivid imagery on display, and some nicely written characters with intriguing interactions on the normal side of the fence, but the Wolves are ciphers and the story increasingly feels like a video game rather than a narrative. I don’t know. Maybe the trilogy as a whole will work, but if it does I feel it will be despite the structure of the story, not because of it. This entry was posted in book review and tagged book review, Mark Morris, Wolves of London. Bookmark the permalink.